Soaring summer temperatures shouldn’t be a hindrance to sightseeing in the French Quarter. Most of the historical houses or locations we recommend below are open to the public, so you can take refuge in an air-conditioned space while you explore their historic significance that is tightly woven into the rich tapestry of this city’s past. This restored Federal mansion was built in 1831 and features the only working open-hearth kitchen in New Orleans. The house, adjacent outbuildings, and the courtyard tell a story of what life was like for wealthy Creole families in 1830-1860s New Orleans. 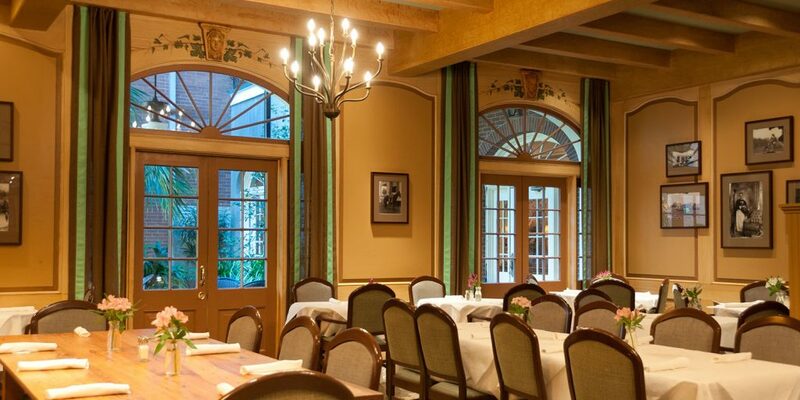 The interior is furnished with period pieces and historically accurate reproductions of carpets and upholstery. A lot of pieces, including family portraits and kitchen equipment, belonged to the generations of Creole families who’ve occupied the house in the past. Gallier House is named after James Gallier, a prominent architect who designed it more than 150 years ago. At one time, the house was outfitted with the latest technology of the 19th century. The kitchen and the bathroom even had running water, both hot and cold! The house is packed with antique children’s toys, chandeliers, and period art. The tour also touches upon the lives of the enslaved people and domestic servants who made this luxurious lifestyle possible. For the summer, portions of the house are redecorated in the “Summer Dress” tradition of protecting the furnishings from the elements and the insects, to show what life was like here during the hot months — before air conditioning, electric fans, and window screens. Built by Confederate General Pierre Gustave Toutant Beauregard in 1826, the Beauregard-Keyes House stands opposite the old Ursuline Convent, boasting a splendid garden and lavish interior. The house changed hands many times and is now owned by the Keyes Foundation, which was established by the late resident, Frances Parkinson Keyes, who restored the house. The Historic New Orleans Collection (THNOC) is a museum and a research center spread over 10 historic buildings in the French Quarter. The Royal Street location (533 Royal St.) houses the main museum with a permanent exhibit on state history, plus rotating exhibits on history and art. The two current exhibits, featuring jazz posters and the history of Storyville, run through December. The Chartres Street campus (400 and 410 Chartres St.) houses art galleries and the Williams Research Center. The THNOC offers daily docent-led and free self-guided tours (accessible via your smartphone) of historic buildings and courtyards at several locations in the French Quarter. All tours begin at 533 Royal Street. 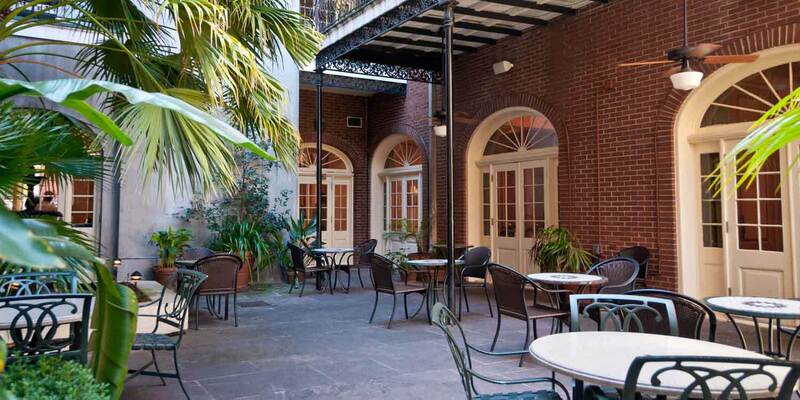 The Architecture and Courtyard Tour will take you to the Collection’s Royal Street properties. The Williams Residence Tour offers a visit to a house museum inside an Italianate, two-story townhouse built in 1889, full of original furnishings and featuring a lush courtyard. Madame John’s is considered one of the best examples of French colonial architecture in North America. It was built in 1788 and miraculously survived the infamous fire of 1794. 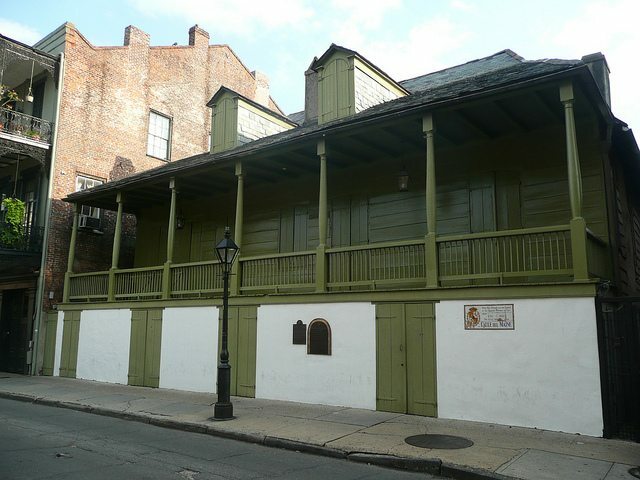 This Creole compound, located on Dumaine Street between Royal and Chartres, consists of the main house, kitchen with cook’s quarters, and the two-story garconniere (gentlemen’s guest quarters). The main house is the only building open to the public. It was a museum until 1965, then closed due to hurricane damage and restored in the 1970s. Today it belongs to the Louisiana State Museum and houses a ceramics exhibit. Fun fact: The house was named after a fictitious character in George Washington Cable’s 1873 short story ‘Tite Poulette. Lafcadio Hearn also mentions it in his 1883 article, “The Scenes of Cable’s Romances,” describing it as a “very peculiar house, half brick, half timber.” Also, parts of both Interview with the Vampire and 12 Years a Slave were filmed at Madame John’s. Tennessee Williams rented many apartments in the French Quarter over the years, but the Dumaine property, located between N. Rampart and Burgundy streets, is the only home he’d ever owned in New Orleans. Williams bought the 1835 Greek Revival townhouse in 1962, by then fully restored to its former glory and featuring three smaller and three full-floor apartments. Williams lived off and on in a second-floor apartment until his death in New York City in 1983. Williams apparently grew tired of having to maintain the townhouse, so he sold it to Drs. Bronson Lutz and Kenneth Combs in 1983. The new owners agreed to let Williams retain his apartment indefinitely for $100 per month. Faulkner was working on his first book when he came to New Orleans to visit a friend who lived in the Pontalba apartments. After staying there for a while, Faulkner then ended up sharing a yellow four-story house on Pirate’s Alley (and, apparently, many adventures) with his artist friend, William Spratling. The former apartment building is owned by Rosemary James and Joself DeSalvo, who have restored it. The owners live above the charming bookstore DeSalvo opened on the first floor, Faulkner House Books. DeSalvo also co-founded Pirate’s Alley Faulkner Society, a nonprofit that holds an annual Words & Music literary festival in the city. Lafitte Blacksmith Shop is housed in a crumbling Creole cottage on the corner of Bourbon and St. Philip streets. It was built between 1722 and 1732, and it’s said to be the oldest structure used as a bar in the U.S. Legends swirled for centuries that this location was used by the infamous Lafitte Brothers, Jean and Pierre, as a base for their privateer operation in Barataria. The bar has a unique ambiance and is popular with locals and visitors alike. Very few French Quarter locations boast a past steeped in as much darkness and downright horror as the Madame LaLaurie Mansion on the corner of Royal and Gov. Nichols. Its gruesome story, shrouded in legend and speculation, comes up as a subject of many haunted and history tours of the French Quarter. The tragic events that occurred in the house had included a suspicious death of a slave girl and tales of madness, torture, and cruelty. This arc of tragedy culminated in 1834 in a fire, leading to some disturbing discoveries that spawned public outcry, a justice-demanding mob, and the subsequent escape of the owner, Madame Delphine LaLaurie, to Paris. Ever since there have been reports of paranormal activity and a general sense of gloom and doom hanging over the house. The 10,000-square-foot mansion and its former slave quarters have been used as a girls’ school, a furniture store, rental apartments, and a homeless shelter. Actor Nicolas Cage purchased the building in 2006, but lost it to foreclosure three years later. Madame LaLaurie herself was a very fictionalized subject of the third season of American Horror Story, “Coven,” but the scenes featuring the mansion were filmed inside and outside of the Hermann-Grima and Gallier houses, not at the mansion. The house is now a part-time private residence of a Texas-based family and is closed to the public.